Motorcyclists have a 35% higher chance of being in an accident than someone driving a car. Coincidentally, they also probably have a 35% higher success rate when asking for a date, but we’ll save that discussion for another time. When an accident, or even theft or vandalism happens, there’s a lot of confusion, worry and fear to sort through. That’s why we’ve put together a heap of information to guide you through the whole process. Maybe you were just in an accident, your bike was stolen, or you’re just here to prepare yourself. You know, just in case. These 6 steps will help you handle the first minutes and days after the incident. Feel free to print this out, it fits perfectly in any saddlebag or nightstand. Step 1: Check for injuries. NOTE: Some injuries may not appear for several days, so pay close attention to your bod. Step 2: Call for help! If you’re not able to get back on your bike and ride away safely, call 911. Step 3: Assess the damage. Make sure you’re in a safe location on the road/highway/parking lot. Then, inspect your bike from wheel to wheel and any other vehicles involved. Step 4: Get all the details. Like, all of them. Write down the other driver’s contact and insurance information, any witnesses’ contact information, and snap photos and videos of the crash scene that show the driving conditions, location and any damage to all vehicles involved. Step 5: Get your bike off the road. Even if it’s completely wrecked, get your motorcycle out of the way of moving traffic. If it’s not obstructing traffic, leave it. Step 6: Contact your insurance agent. It's not necessary to do this immediately after the crash, but the sooner the better so they can help guide you through the next steps. Whether or not to file a claim really comes down to what you feel you can afford. Insurance is for the stuff you can’t afford to replace out of pocket. If the cost of repairing the damage is $505 and your deductible is $500, filing a claim would definitely not be worth the risk of your premium going up for a difference of $5. If you’re responsible for the accident and can be held liable. If the cost to repair your motorcycle significantly outweighs your deductible. If you’re involved in an accident with an uninsured or underinsured motorist and you don’t have uninsured motorist coverage. If you or anyone else involved has serious injuries. If you’ve determined you need to file a claim, you’ll want to do it as soon as possible. Waiting to file can cause the insurance company to deny your claim. What’s the Difference Between Motorcycle and Car Insurance Claims? The general steps for filing a claim are the same for a car and a motorcycle. However, if you find yourself filing a motorcycle claim, there’s a chance your insurance adjuster will be someone who is more educated on bikes than your average car adjuster. This is a good thing! Having an adjuster who understands motorcycles can provide a more accurate report on damage and replacement costs. You can probably swap some pretty sweet stories too, eh? It's also a smart idea to give yourself and your body a few days after any accident before you file a claim, since some injuries may not appear right away. The last thing you want to do is report one set of injuries and then have to change your story a little later. 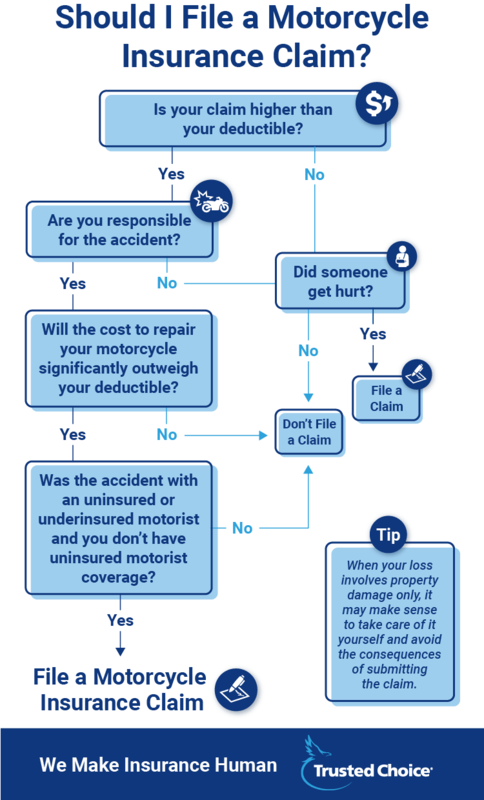 How Do Motorcycle Insurance Claims Work? Step 1: You’ll call your insurance agent (or the company’s claim division). After you’ve followed our steps to take if something bad happens, you’ll call your insurer and report the accident/loss. Step 2: They gather information. Step 3: You’ll tell your story. Your insurer, and possibly the insurer of anyone else involved, will call you to hear your side of the story. Always tell the truth! Step 4: An adjuster will be assigned to your claim. Your insurer will assign a professional to calculate the cost of damage. Step 5: The insurance company will work up a report. Depending on your policy, your insurer may help get your bike to a shop or determine if you need a rental to help get you back on the road. Step 6: Deal with medical bills. If serious injuries are involved, your insurer will deal with the medical bills of you and others. Step 7: Sit and wait! Your insurer will let you know what’s next and guide you through any next steps. You never really know when bad things might happen, but you can prepare yourself with a few lil’ old preemptive measures to make the claim process go more smoothly. In the case of an accident, the more your insurance agent knows about you, the more they can advocate for you. Plus, they know a lot about filing claims that you may not. When getting motorcycle insurance, be sure to mention if you’re a member of any clubs or have completed any safety training. Ask your insurer questions about what can make a potential claim go more smoothly. A variety of factors go into whether your premium will be raised after a claim. Some insurance companies offer good driver discounts and other forgiveness packages. Your potential premium increase will depend on the severity of your accident, your insurance policy, and your driving record. Now that you know the ins and outs of filing a claim, here are a few things to remember if you find yourself in an accident or are a victim of theft. Lying about what happened in the accident will benefit no one. Wait a couple days to file your claim. While you shouldn’t wait too long to file a claim, there’s a good chance that injuries may not appear immediately after a motorcycle accident. You can call your agent without filing a claim. Calling your agent to let them know you’ve been in an accident does not mean you have to file a claim. When it comes to filing a claim, your Insurance agent can be your wingman or wingwoman. Let them guide you in the process and the best steps to take, and help you determine whether you need to file a claim at all. It’s what they love to do.